Biomedical Signal and Bioinformatics attempt to make sense of signals and large amounts of data mined from biomedical research. ICBSB 2018 is a main annual research conference aims to bring together researchers around the world to exchange research results and address open issues in all aspects of Biomedical Signal and Bioinformatics. This conference provides opportunities for delegates from different areas to exchange new ideas, applications and experiences face to face, to establish business or research relations, and to find global partners for future collaboration. ICBSB 2018 features invited speeches as well as peer-reviewed paper presentations.The conference is completely open for all who are interested in the related fields of Biomedical Signal and Bioinformatics. You can choose your publication preference from the below two options, and please let the conference secretary know about your preference by email. Accepted papers will be published in the conference proceedings, which will be indexed by Ei Compendex and Scopus and submitted to be reviewed by Thomson Reuters Conference Proceedings Citation Index (ISI Web of Science). Please prepare your abstract or full paper according to one of the following templates. 2: Email submission directly to icbsb@iacsit.net. Your submission will be confirmed by conference secretary in 2 working days. For any questions, please feel free to contact icbsb@iacsit.net. Prof. Robert Minasian, Prof. Mao Kezhi and Prof. Xudong Jiang have confirmed to deliver a speech at the conference. 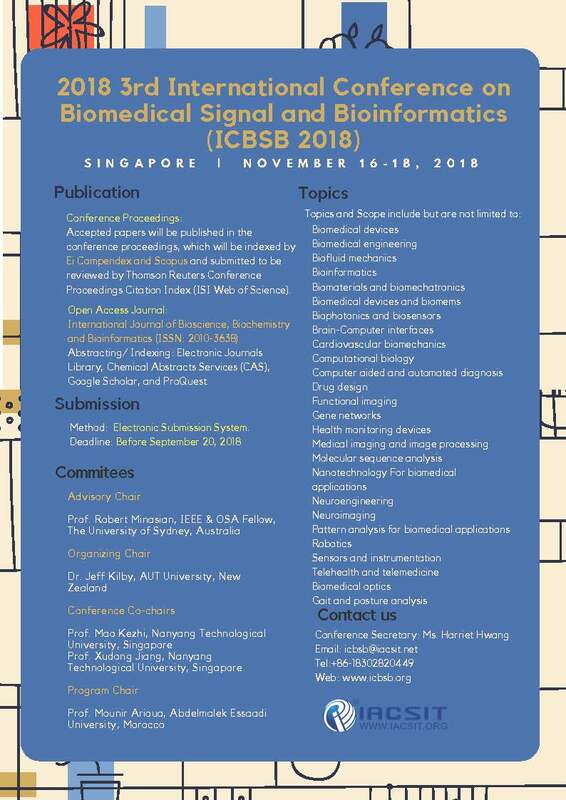 ICBSB 2018 will be held in Singapore during November 16-18, 2018. It is open for submission now. Congratulations! Xiang Zheng (National University of Singapore, Singapore) and Chun-Wei Tung (Kaohsiung Medical University, Taiwan) won the best presentation award.